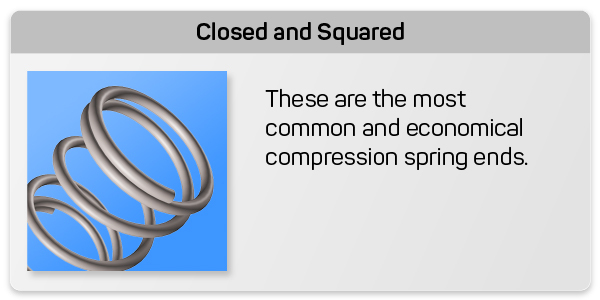 Definition: The variety in compression spring end types depends on how the ends of the compression spring are made depending on the requirements your compression spring will have to meet based on your device’s functions. Choosing a compression spring end type can be rather difficult if you’re not informed on how each end type helps. This is why we’ve decided to provide you with all of the information you need in order to pick an end type. In the list of end types below you will learn what the end types are called, what they look like, and what each one is for. Closed and squared ends are the most common type of ends. This type of ends allows for your spring to stand vertically when placed on a flat surface since the last coil on the ends is closed at the time it is being manufactured on the coiling CNC machine. This is the case as long as the spring doesn’t have a high slenderness ratio. The slenderness ratio of your compression spring is the proportional ratio between your spring’s diameter and free length. If your spring’s free length is approximately 4 times larger than its outer diameter or more, there is a probability that your spring won’t stand vertically on a flat surface or it might bend or buckle when being compressed. Besides having a large slenderness ratio, your spring should be able to work just fine. And in any case that you do have a long free length in comparison to your spring’s diameter, placing the spring over a shaft or inside a hole will prevent the spring from bending or buckling. 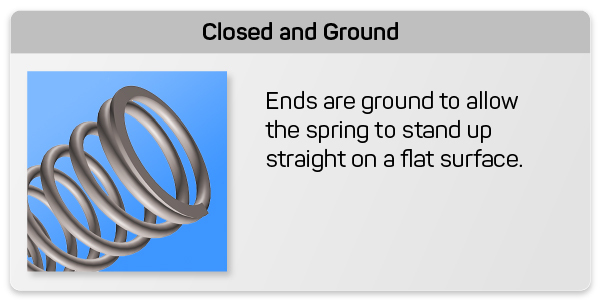 Closed and ground ends are also common but they are more expensive. This is because the ends are not going to come ground directly from the coiling CNC machine like a spring with closed and squared ends does. Grinding the ends of these springs is additional to their manufacturing and it is also manual labor therefore costing more money. Closed and ground ends will help your compression spring stand vertically straight on a flat surface when the slenderness ratio is too large. This means that, if your spring vigorously needs to stand vertically straight and it is not going over a shaft or inside a hole, closed and ground compression spring ends are your best option. Double closed ends are very similar to closed and squared ends. In this case, the difference is that instead of the spring having one closed coil at the ends, it has two. These type of ends can be manufactured directly from the machine as well in the same way we make extension and torsion springs where all of its coils are touching. They might be a little more expensive since it’ll take more material to manufacture them versus having them made with only one closed coil at the ends. They are used to provide stability when your spring has a high slenderness ratio and runs the risk of bucking. This is a more economical option versus choosing a closed and ground end type. 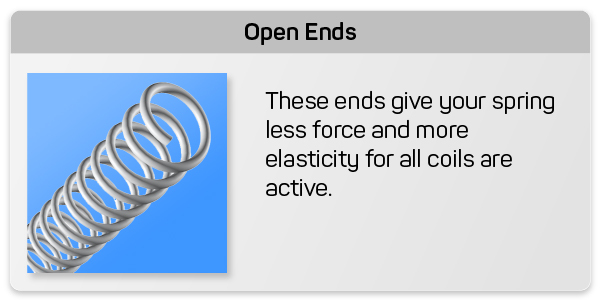 Open ends aren’t very common since a spring with open ends will not be able to stand at all. All of its coils are open which means they all have pitch in between them. Since compression springs cannot stand with this type of ends, you will definitely need to either insert them inside a hole or place them over a shaft or mandrel. They are needed in case you need your spring to be weaker but cannot add more coils to avoid increasing the solid height. Making the ends of the spring open will be like adding two more coils except you’re only replacing the closed coils at the end. This makes your spring weaker by adding more active coils yet your solid height remains the same since those coils at the ends were only replaced by open coils.